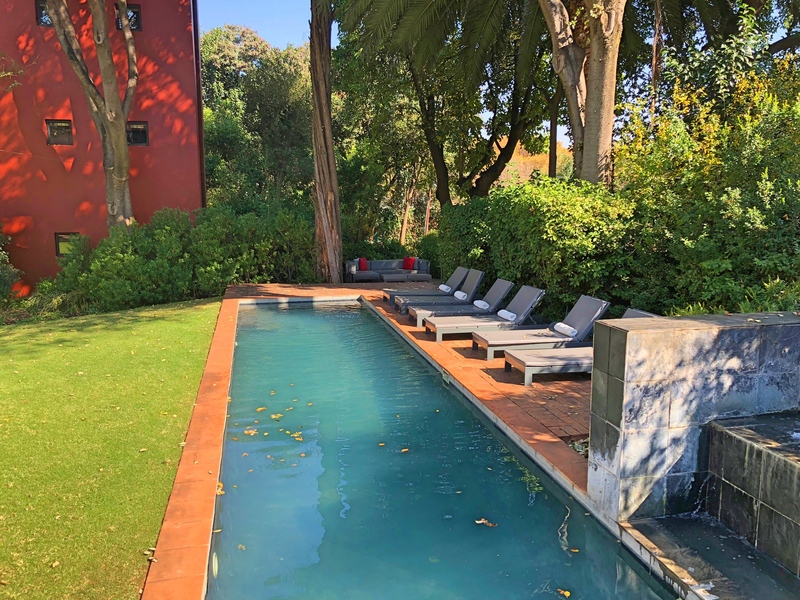 The highlight of our stay in Johannesburg was our little 10-room lodge in the Rosebank neighborhood, Ten Bompas. Fireplace, separate living room, free wine and even liquor in the room, lovely pool and outdoor area, great food. That’s enough to make me want to go back even if the rest of the city is boring. From New York it was the commute from hell to Johannesburg, South Africa. The route consisted of a 10-hour overnight flight to São Paulo, Brazil, an eight-hour layover, and then an eight-hour overnight flight to Jo-burg, as it is known. Yeah, two nights in a row without a bed, followed by some serious jet-lag. Oh, and I managed to catch a cold in the process (probably related to the lack of sleep) so our short stay here was less than ideal. It’s worth saying that we love South Africa, but we explored it pretty well back in 2000 and I did a couple work trips to Cape Town in 2003 and 2004. 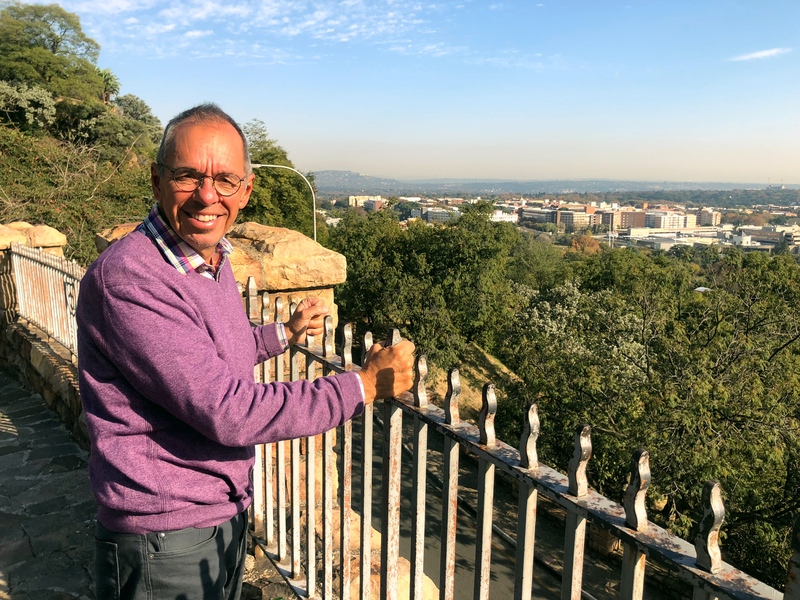 So instead of revisiting places we like, especially Cape Town, we planned just a short stop in Jo-burg before moving off to new adventures into deeper Africa. Neither of us have spent any measurable time in Jo-burg, apparently for good cause. As much as we love the rest of South Africa I’ve never heard anyone say a good word about the tourism experience here. It’s allegedly a good place to live if you need to do business in South Africa and don’t mind living in a secure, gated community in constant fear of crime but for a tourist there’s not much. The view from lunch on arrival at Ten Bompas. That little couch at the end of the pool with the red pillows was my home the two afternoons we spent there. Heavenly. One amusing thing to note about Jo-burg: it’s fall here, and it even feels a bit autumnal. What’s cool is that just two months ago we were experiencing winter in Duluth. Then we had spring in Nashville & Atlanta, followed by summer in Miami Beach and Key West. Back to spring in Boston and New York, and now fall in South Africa. We’ve managed all four seasons in just two months! 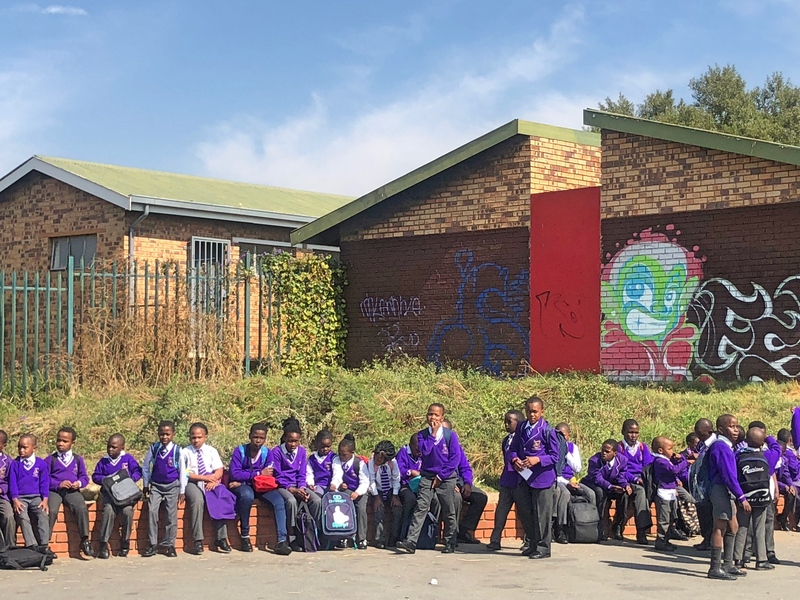 We did one half-day excursion, hiring a driver/guide to take us to Soweto, the famous black township near Johannesburg that was the scene of student anti-apartheid uprisings in the 1970s. We were surprised by how relatively middle class it seemed, at least the part our guide took us through. In contrast he’d also driven us through downtown Jo-burg which really seems like a deserted, crime- and drug-infested hell hole. 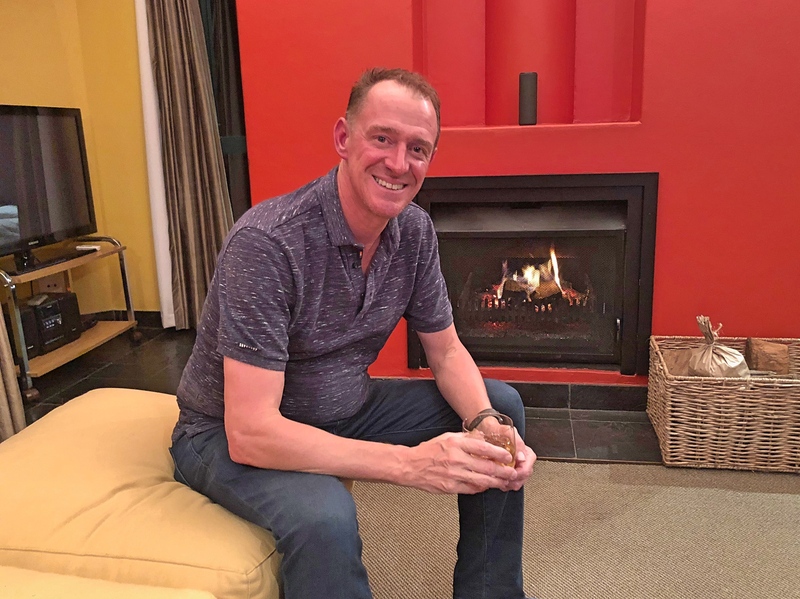 Mark asked our driver – a black native South African – if he would be comfortable walking in downtown; he quickly said no. At any rate, there were two sites to visit in Soweto (short for SouthWestern Townships), a big Apartheid Museum and a much smaller museum consisting of a house that Nelson Mandela lived in for some time and that his wife Winnie kept during his decades in prison. The Apartheid Museum was well done and really interesting. There was a special, temporary exhibit on the life of Nelson Mandela where I spent most of our two-and-a-half hour stop, while Mark focused on the permanent apartheid section. Both were comprehensive, interesting, informative … everything you would want in a history museum. In fact, given that I did one section while Mark did another we could have spent a few more hours there if we’d had the stamina. 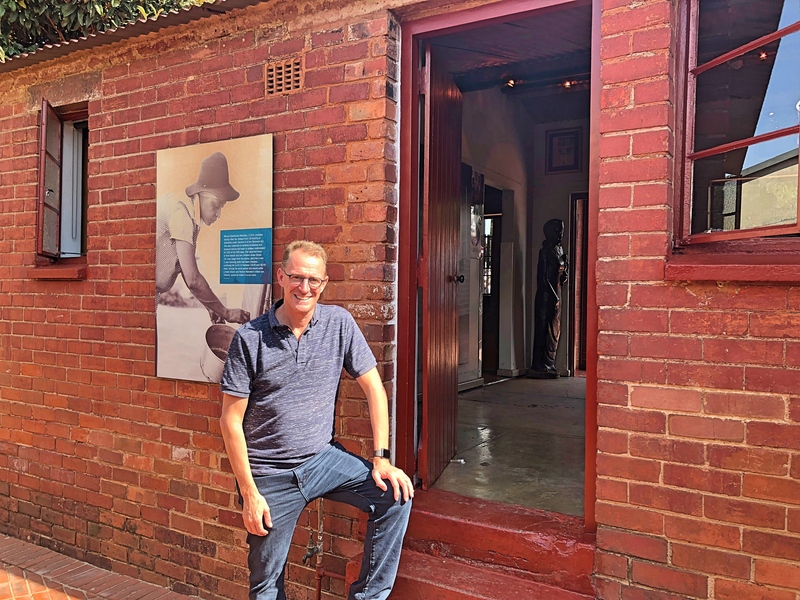 Mark standing at the entrance to the Mandela family’s home in Soweto. It was tiny but remained a focal point for the resistance. The Mandela House, focused on a tiny house in Soweto where Mandela moved in 1946, was a much quicker visit. A local guide there was supposed to show us around but, to put it mildly, she was a terrible guide. Just a monotone “In 1952 blah blah blah. In 1961 blah blah blah.” Everything we hate about most guides except this one was just remarkably bad. After a few minutes I asked if we could just walk around ourselves and read the descriptions on display and that worked at least a little better. Otherwise there is not much to say about a short stay in Jo-burg. Nice hotels are in secure upscale white neighborhoods. White people live in gated white communities and go to upscale restaurants where everyone else is white and being served by black staff. You don’t walk anywhere, lest you become a crime victim. I’m sure this is an improvement over apartheid but it is still more than a little discouraging. On the other hand on our second night we went to a nice, upscale restaurant where the clientele was almost entirely black and the servers were mixed, perhaps even mostly white. Something to be encouraged by. From here we hop a quick flight up to Livingstone, Zambia, to view Victoria Falls. That should put us in an African state of mind! 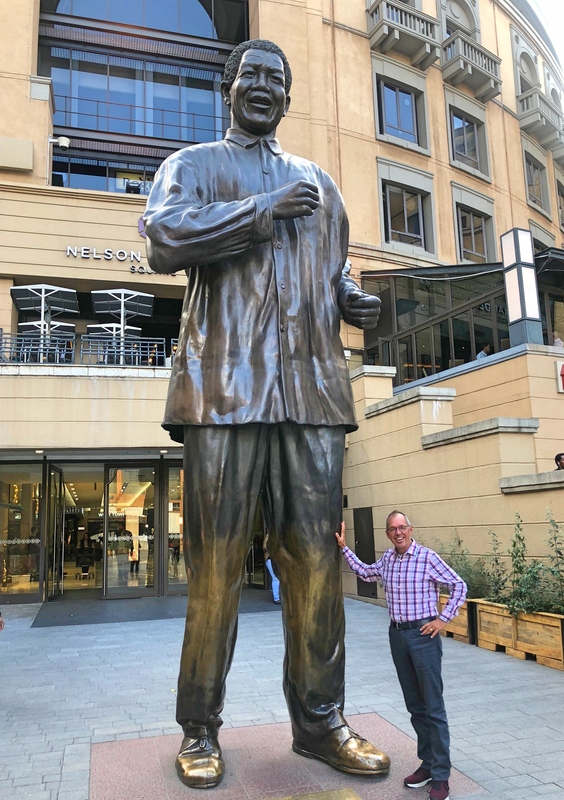 When they say Nelson Mandela was a larger-than-life figure, they aren’t kidding! 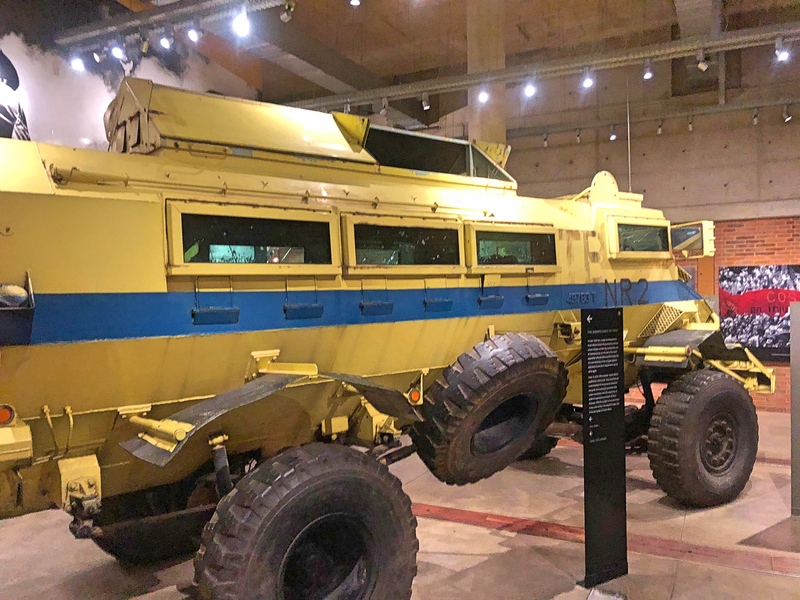 One of the riot control vehicles used against students in the 1970s. They weren’t messing around. Today’s students come to these sites on guided tours. When I saw those purple school uniforms I thought I should have gone there! On a hill overlooking Johannesburg. Nothing that interesting about the picture, but that pretty much captures my thoughts on Johannesburg itself. The highlight of our stay, though, was Ten Bompas. 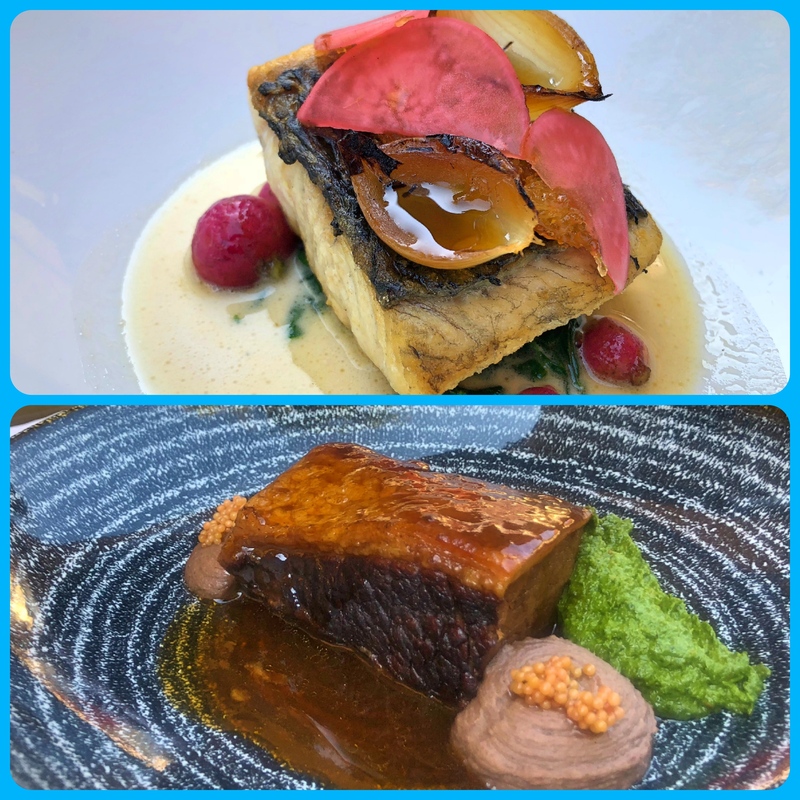 Beautiful little hotel with great food, including these two main course dishes from lunch.